It was a different story this season and his second crack at the popular competition for riders aged between 14 and 21, each of them on virtually identical Suzuki GSX150F bikes, finally gave him the glory he deserved when it all wrapped up at Taupo’s Bruce McLaren Motorsport Park on Sunday. It should probably not have come as any surprise, the 16-year-old Stroud is son of Suzuki’s record nine-time New Zealand Superbike Champion Andrew Stroud. Jesse Stroud finished equal first on points with Taupiri’s Zak Fuller in the GIXXER Cup contest after the two rounds that were incorporated into the Suzuki Series in December, then he powered away from the pack during the five-round New Zealand Superbike Championships series, turning the GIXXER Cup into a seven-round series. Stroud won eight of the 14 GIXXER races staged during the nationals phase and ended up a whopping 26 points clear of main rival Fuller, with Greymouth’s “West coast Warrior” Clarke Fountain claiming the third podium spot for 2019, 40 points further back. The points differentials belie the fact that this class of racing was the closest and most fiercely-fought of all the categories in action during the Suzuki Series or the superbike nationals. There were always a bunch of riders never too far from a podium finish, with Sanson’s Shane Miller, Feilding’s Justin Maunder, Whanganui’s Caleb Gilmore, Whanganui’s Luca Durning, Waiuku’s Hamish Simpson, Rotorua’s Curtis Boyd and Whanganui’s Cameron Goldfinch all impressing on a number of occasions, with each of these riders eventually earning a top-10 finish for the series. 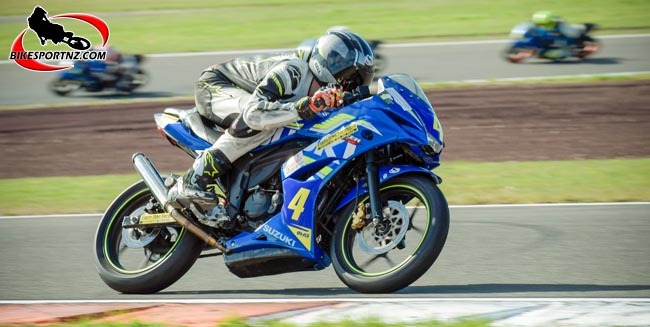 Perhaps in the near future, one or two of these individuals will follow the example of Glen Eden’s Daniel Mettam, the 23-year-old Suzuki hero who was crowned national champion in the premier 1000cc superbike class on Sunday. “I’m really happy with how it all turned out,” said Jesse Stroud. “The racing has been really competitive all year and especially chaotic at the Manfeild round,” he said. This sort of graduation was perhaps the intention anyway when Suzuki New Zealand first hatched the class in December 2017, this “motorcycling nursery ground” introduced into the popular Suzuki Series that year and then continuing on to form an integral part of the superbike nationals that followed. The success of Suzuki’s initiative is undeniable, with several riders from the inaugural GIXXER Cup competition last year moving on over the winter to campaign bigger bikes in different classes in the national superbike championships this season, riders such as Tarbon Walker, Matt Brough, Harry Parker and Blake Ross. Whanganui’s Walker ended his 2019 campaign finishing runner-up in the Superstock 600 class, Timaru’s Parker took third overall in the Superstock 300 class, Paeroa’s Ross finished fifth overall in the Supersport 300 class and Paraparaumu’s Brough finished sixth overall in the Pro Twins class. Meanwhile, it is interesting to note also that Jesse Stroud’s elder brother Jacob Stroud also tasted national title-winning success at the weekend. Jacob Stroud won the Supersport 300 class and the Superlites class as well. And a third Stroud sibling, Caleb Stroud, finished the championships ranked 12th overall in the GIXXER Cup. Other title winners after the weekend’s final round of the series at Taupo were Glen Eden’s Daniel Mettam (superbikes class); Rangiora’s Avalon Biddle (Supersport 600 class); Hamilton’s Papamoa’s Leon Jacobs (250 Production class); Whangamata’s Ben Rosendaal (650 Pro Twins); Australia’s Yanni Shaw (125 GP) and Taupo’s Andy Scrivener and Tina McKeown (sidecars).